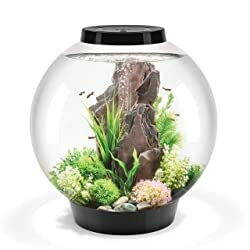 The aquarium market today develops so many 15 gallon aquariums in different shapes from traditional rectangle, column to sphere, so you have so many options when considering buying one that meets your needs. Below are some of the most amazing aquariums that will give your home the charming ambiance it needs. Others: FLEXPad remote control, low-voltage transformer. This is one of the loveliest 15-gallon fish tanks that you will ever find in the market. The first thing that will catch your eyes is the clarity of the display. The front glass panel is vertically curved offering a stunning view when you enjoy the tank from the front. It makes a feel that your fish and plants look a bit bigger. The grid pattern at the top of the aquarium makes it look great. This is precisely what you need to make your home gorgeous and lovely. The tank comes with an LED lamp which allows you to view your fish even at night. Moreover, the 7500K white light from the LED lamp is able to help in plant growth and enhances fish colors. There is a remote control with many color adjustment buttons allowing you to adjust each color channel separately to reach your desired lighting effects. Unlike other aquarium kits coming with internal or Hang-On-Back filters, the filtration system of this tank is a panel fixed in its back. 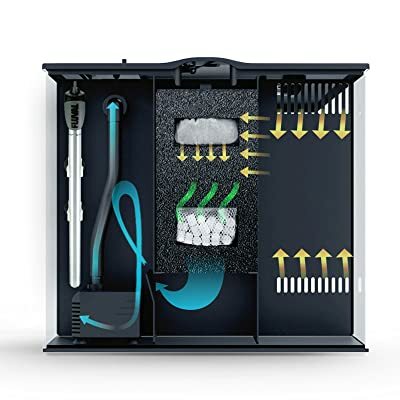 The back panel filtration includes three compartments for placing a water pump, filter media as well as your choosing equipment. When the filter is operating, the water is drawn into the right compartment, then it goes through and is filtered in the middle one containing filter media. And finally, the pump in the left compartment returns the filtered water to the main tank. By this design, you can place a large amount of filter media in the middle compartment for optimal water filtration. 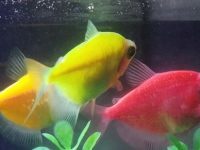 Others: LCD thermometer, fish net, tropical fish flakes, water conditioner, cycle biological enhancer, freshwater care guide. The best thing that makes the Fluval Vista aquarium stand out from traditional rectangle fish tanks on the market is its unobstructed panoramic design. The curved glass front makes the feel that the tank is molded from a glass block rather than glass panels being sealed together by silicone. This design makes the tank unobstructed and great to view from the front. The tank comes with a hinged hood that is very easy to open or close for doing weekly aquarium maintenance. The back of the hood is designed with positions for you to place a Hang-On-Back filter and heater. The front of the hood features a feeding hose with a small cover that can be opened easily to feed your fish. Under the hood is an LED light fixture with a soft-start feature that is able to gradually illuminate to not startle your fish. The light features two lighting modes blue and white that can be controlled easily by pressing corresponding buttons on the lid. The AquaClear 30 clip-on filter in this aquarium kit, in my opinion, is the best power filter on the market today. 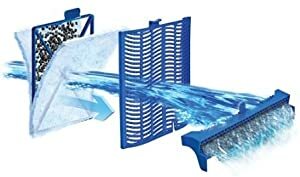 The filter features an abundant filter chamber that can accommodate a large number of ceramic rings as well as other filter materials for the most efficient filtration. The AquaClear 30 filter provides a maximum flow rate at 150 gallons per hour and is rated for a 10-30 gallon aquarium. 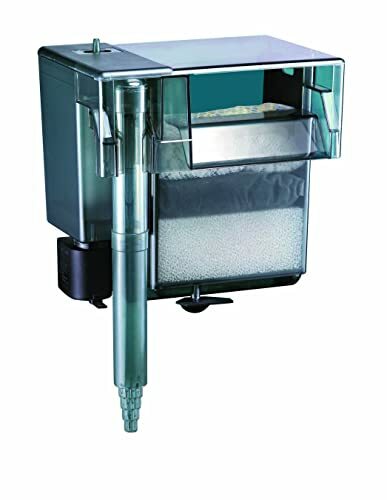 The great news is that the flow rate is adjustable by rotating the flow control knob on the top of the filter, so you don’t have to worry about the return water flow being too high to stress your fish. 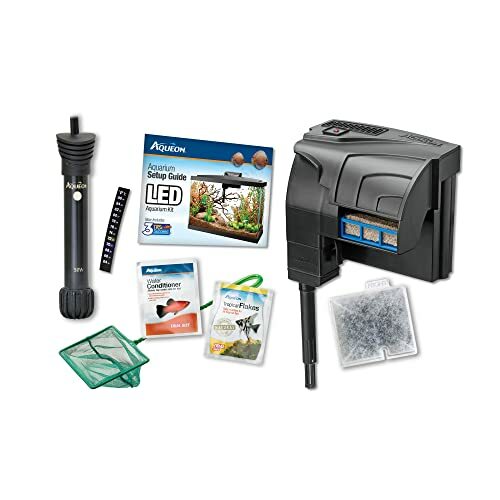 The kit also comes with most things you need to set up a tropical fish tank such as a heater, LCD thermometer, fish net, tropical fish flakes, water conditioner, cycle biological enhancer. A freshwater aquarium care guide is also included to help you to start your first fish tank. 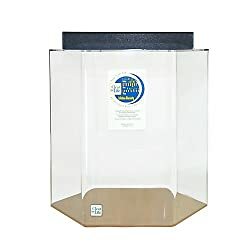 The tank measures 24 inches wide and 12 inches deep that is same as the width and depth of a standard 20 gallon aquarium, so it is very to choose a stand that fits the tank. Just choose a 20 gallon aquarium stand that your love best. Additives: thermometer, fish net, and fish food and water conditioner samples. If you have never owned a bow-front aquarium before, you should give this tank a try and realize how it amazes you. The tank is made of clear class sheets sealed with black silicone that gives it a very durable and elegant look. The front glass sheet of the tank is nicely curved to attain the best view from most angles. It comes with a black plastic hood with a built-in low profile LED lamp. The lamp is to make sure that your fish tank remains visible at night. The Quiet Flow 10 LED Pro power filter is the most powerful piece of this kit. The filter operates so quietly, so you don’t have to worry about noise produced during water filtration. The filter uses a filter cartridge and its multi-step filtration system to perfectly purify the water. 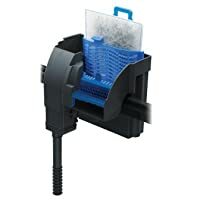 A wonderful feature of this filter is its LED indicator on the top that is able to monitor actual water levels to know when the filter cartridge is clogged and need to be changed. The kit comes with a submersible preset-heater and thermometer to keep the water temperature at a desirable range for tropical fish. 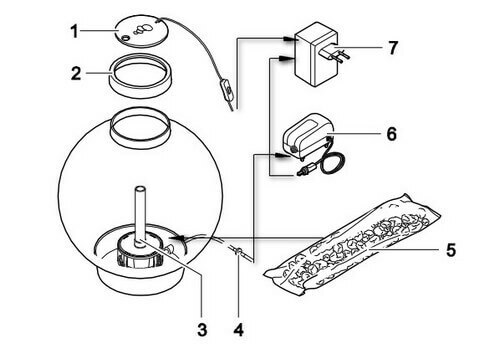 To help you have an easy starting time, the package comes with a detailed guide for setting up the tank. Samples of fish food and conditioner, which are necessary for aquarium setup and maintenance, are also included. This is also a glass fish tank from Aqueon like the previous; however, it features a column shape with a smaller footprint for an absolutely different experience. The tank is covered by a hood with LED lighting rails under it. The hood is designed to fit perfectly over the aquarium frame to create a stunning flat profile that makes the entire tank look stylishly and more attractively. It is ideal to set up a planted tank with this column aquarium. The higher profile makes the tank ideal for most beautiful tall aquarium plants of Rotala, Ludwigia, Hygrophila and Vallisneria species. Just place a tall bogwood in the middle of the tank and put some plants around it and you have a beautiful planted tank like one in the product picture. The equipment and supplies included in this product absolutely like ones of the previous aquarium kit. They comprise a filter with cartridge, heater, thermometer, fish net, and fish food and water conditioner samples. The package also comes with a detailed guide for setting up a freshwater tropical tank. Filter, heater and light are NOT included. 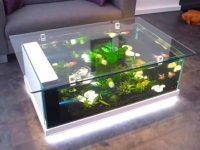 If you are the type of aquarium lover that fears glass aquariums because of their fragile nature, this acrylic tank will make you love it. The hexagonal shape gives a 360 degree view while only occupying a very small footprint. 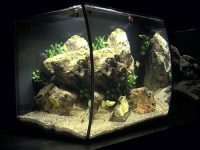 This tank is one of the best acrylic aquariums you can have in your home. The tank doesn’t include a filter and heater, so you have to buy them separately. 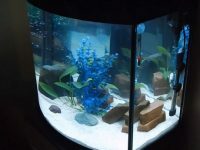 A 20 gallon aquarium filter and a 50-watt aquarium heater can work well for this 15 gallon tank. It also doesn’t come with a lamp; however, the hood is designed for easily setting up a lighting system. 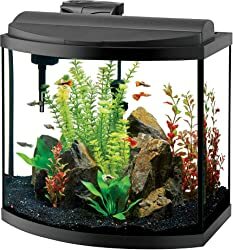 You can buy a small LED aquarium light to attach it under the hood or just throw the lid away and replace it with an LED light fixture with extendable brackets. Others: 12V transformer, air stone, water conditioners, beneficial bacteria liquid. This is totally a cool fish tank to have in your office. The tank is wrapped around with seamless colored acrylic that makes it look awesome and perfectly mix with your modern home furniture. 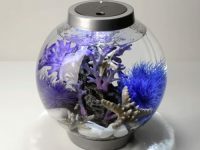 The tank doesn’t occupy too much space with its small footprint but the beauty it brings to your home decor is enormous. (1) The LED light unit with ON/OFF switch provides just enough light to give needed visibility at night. (7) The 12V transformer connects the light and the aerator to a power supply. It is not too hard to understand the filtration mechanism of this biOrb Classic aquarium. It is an air-powered system. The external aerator pumps a constant air flow to the box filter. 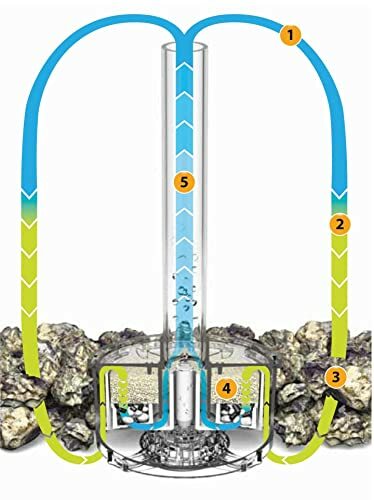 The air flow then escapes out of the water through the air tube of the box filter (5) that creates circulation water flows (2) through the filter media inside the filter box and bottom substrate (3). 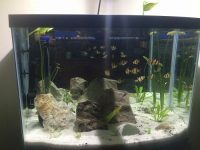 By this way, floating wastes and harmful nitrogenous toxins in the water are trapped and processed leaving your aquarium with clean and clear water. 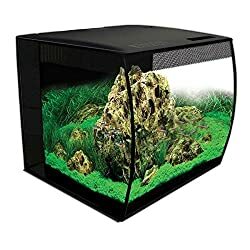 Just attach the filter box in its place in the middle bottom of the tank and spread the ceramic media around the box and the filtration system will do its work to keep your aquarium clean and clear.